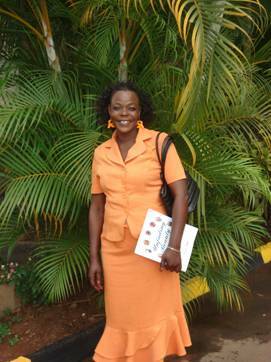 My trip to Uganda started in the early morning of Friday the 21st of March 2008. I flew out of Amsterdam at 10.50. I left home about 5.00 in the morning to go by car to the city, catch the train at 6.00 and arrived at the airport at about 8.00. I arrived at Entebbe Airport at about 21.00 local time. I was welcomed by Francis Okech, his three adorable children, Samuel, Mary and Benjamin and the sister of Francis, Rosemary. That night on our way home of we had something to eat, talked with one another and so we got aquinted with one another. We only had contact via e-mail through the years and never met. The following day, Saturday, we went to Kampala to have a good breakfast, to enjoy the sights in the city and to rest for the days that were to come. We discussed our plans for the week. Kampala, where Francis lives, is a beautiful city. Very busy. A real eye-opener!!!! I have never seen such a variety in fruits as in this country. I want to say a word of thanks to the Compton Road Church in Murfreesboro Tennessee who paid for my travel-expenses. Without them I could not have made this trip, I am very thankful for their love and commitment. 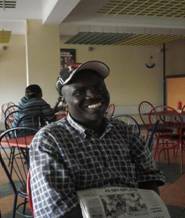 Francis has four children, Francis lost his wife 3.5 years ago, this due to complications when their last two children (twin) were born. The oldest child is in a boarding school. The youngest three are at home. 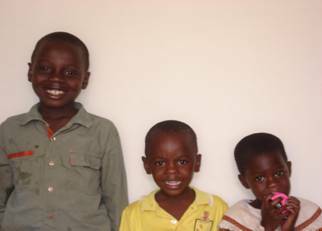 Francis has a young man living with him who looks after the children and his home in his absence. Francis is very dedicated to his children and loves them dearly. Soon after my arrival I bonded with the children, they were very nice. Rosemary is the sister of Francis and is raising her four children on her own. Her husband abandoned her two years ago. 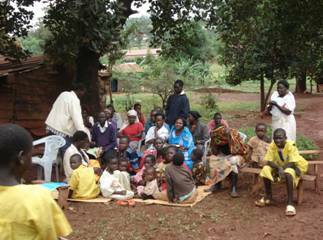 Rosemary is very active in the church as she is teaching the women and children. She is a hard worker and loves the Lord. Many times we were singing hymns and songs in the car on our way to meetings. Rosemary loved it when we were singing and she could just sit and listen. And sing along. The theme for our teaching in Uganda was the love of God, how His love relates to us, how His love affects our lives and our relationship with others. On this day we travelled to Jinja, this city is located almost 2 hours straight west from Kampala. Francis works with the church there. This group is about 50 in number. I preached a sermon on 2 Peter 1: 2- 11. The sermon was titled: Is your life and orchestra? That afternoon we travelled back to Kampala. I spoke there at night about Lot and his decision to move close to Sodom and Gomorrah and our need to make good, wise and solid decisions. This group is about 30 in number. Meeting in Uganda is so much different then we are used to in more modern countries. In Jinja we worshipped in a barn with open sides and in Kampala we worshipped in a tent with open sides. However it was really warm, so we did well. Monday, The 24th of March. This day we returned to Jinja. The Christians there came out on this day to the meeting. I presented three lessons this day on the love of God. I started with 1 John 3: 1 and used that to show how God loves us and how His love is demonstrated to us. I used two sessions to study on these matters. Then I shared a lesson on Coll. 3: 12- 17 how we need to love as God loves us and that we need to forgive as God does. This day we returned again to Jinja. We studied more on God's love for us. This day I took a journey through Isaiah 53. We talked in detail about the sufferings of Christ and how the Father was pleased to have His son bruised for our victory. It was very rich material. We also talked about the parable of the prodigal son and how in this parable the love of God comes to our lives. 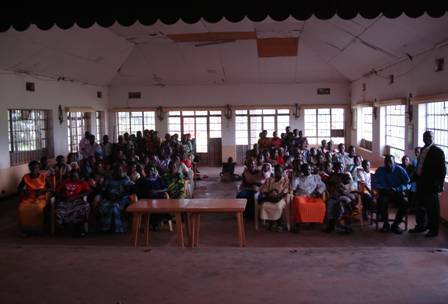 This day our teaching took us to a suburb of Jinja, a place where many of the members live that worship with the Jinja group. The place was called “Masese”. So, we had most of the same Christians and visitors. This day was dedicated to the love and care that God has for us. Again we had three sessions. We talked about Matthew chapter 6 vers 25- 34 and the fourth chapter of Phillipians. It was very rich. This day we met outside “under the tree”. It was good. This day we returned to Masese. We had another productive day of study. I taught two lessons on love, the commitment to love and the commitment to purity. These lessons were based on Collosians 3: 1- 10. It was very good. A good part of my lesson was dedicated on the concept of fornication. We talked about Gods intent about marriage and for sexual intimacy in that bond. We discussed what fornication is and how hurt comes when we do not respect Gods intent for marriage. These thoughts brought many questions, so our last session of that day was decicated to answering questions. On this day we travelled to Tororo. Tororo is about 5 horus travelling from Kampala. Since we did not leave till about noon, we needed the afternoon to drive to Tororo. We arrived there at 17.00 in the afternoon and made sure that all things were ready to teach the next day. It was a nice break for me, I was able to see some more of the beautiful nature of this country. This country is so rich in natural resources. On this day we started meeting in the afternoon. After our first session it started to rain. So, we only met once that day with the church on Tororo. Since they were expecting more rain the next day we went to the local golf-club and rented one of their rooms for Sunday. We did not want to deal with the same problem as Saturday. On this day I did a Bible-lesson first, I spoke on the red sea crossing and how God was their help when they were faced with the Red Sea in front of them and the army of Pharaoh behind them. Later that afternoon we had a third session and I spoke on the love of God in a general way. Their were many visitors so we wanted them to know that God loved them. This lesson was based on 1 John 3: 1 as I had brought earlier that week in Jinja. This day we went to see the daughter of Francis who is in a boarding-school. We took it easy this day, we went to see some beautiful sights. My last day had arrived. Time had gone by fast, this day we went to see the equator. Ir runs through Uganda at about 2 hours from Kampala. We also went and visited the daughter of Rosemary who is also in a boarding-school. Later that afternoon we went home to make ourselves ready to go to the airport. I was to leave that night at 10. 50. It was a really good trip. Francis and I had never met, only had contact via e-mail through the years. We bonded right from the beginning. We had real good studies and talks together and something really good has been established between us. We have already planned that Francis will be coming to the Netherlands in August. We plan to go to Czec Repubic together to the lectures that are held there. These lectures are organized by the church in Prague. We have also planned that I am going to Uganda again probably next year in August. Uganda is a very poor country and one of the biggest problems facing the church is poverty. Francis is a very dedicated preacher, being a former Pentecostal, he is devoted to teach the truth. Francis is a dedicated father to his children. They love him and he loves them.